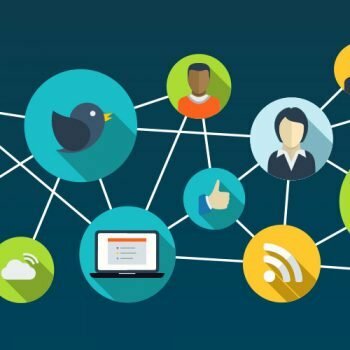 Social networks aren’t limited to just people and what they are doing throughout their lives; social can be focused around the things in our daily lives as well. 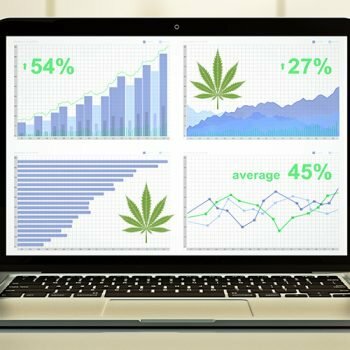 For marketers and businesses in the cannabis industry, knowing where to connect with the marijuana community as a whole is necessary. We all know about Facebook, Twitter, Pinterest, Instagram and Snapchat, but we’ll also give you the rundown about some other focused social networks so that you’re not missing out on any conversations. Cannabis focused social networks are a perfect way to connect with the marijuana community and get a fresh way to connect with others, keep up with trends, follow the latest events, share stats, support others, and so much more. Let us take you on a walk down the cannabis social network path. This social network was founded by two cousins, one of which has first-hand knowledge of the positive effects of medical marijuana. Out of the founders’ shared experience with the positive side of medical marijuana, Russell Thomas (CTO) and Alec Rochford (CEO) formed Duby, which is seen as the largest active worldwide community in cannabis. As an app available in both Android and iOS app markets, Duby allows cannabis users to create their own “duby”, a playful reworking of the term for a marijuana joint, “doobie”. Similar to the dating app Tinder, Duby users swipe left to “put out” a duby and swipe right to pass it along to the next anonymous user. The social network users create a duby consisting of a photo, a video, or a text message that they can share with other users of the app. The content is sent first to the three people closest to the content creator geographically, as determined by the app. 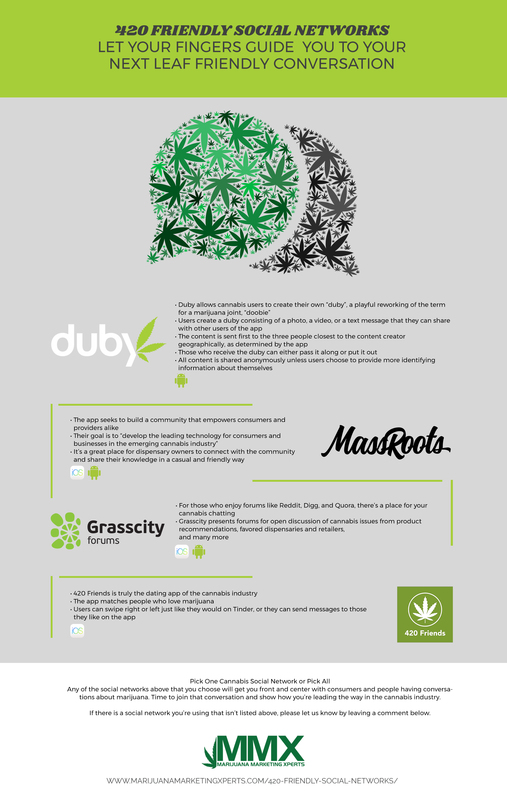 Those who receive the duby, typically consisting of a cannabis-related photo, can either pass it along or put it out. All content is shared anonymously unless users choose to provide more identifying information about themselves. Overall, Duby is a great way to share what you have going on in a dispensary. Time to have your community “swipe right” on the perfect flower or delicious edible. Currently available on Android with iOS coming soon. 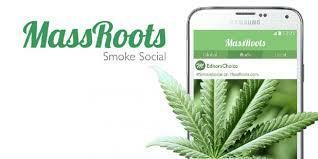 MassRoots is aiming to support the legalization of cannabis. The social network promotes the economic, health, and social benefits of marijuana use. The app seeks to build a community that empowers consumers and providers alike. Their goal is to “develop the leading technology for consumers and businesses in the emerging cannabis industry.” MassRoots also claims it includes some of the most credible voices in the legal marijuana industry. It’s a great place for dispensary owners to connect with the community and share their knowledge in a casual and friendly way. Whether you’re looking to discover new weed strains and products, read ratings and reviews, or share your marijuana experiences with like-minded people, MassRoots is a good social network to look at. For those who enjoy forums like Reddit, Digg, and Quora, there’s a place for your cannabis chatting. Grasscity presents forums for open discussion of cannabis issues from product recommendations, favored dispensaries and retailers, and many more. Grasscity Forums is available on iOS and Android. 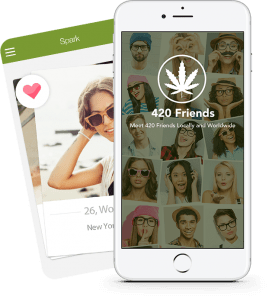 420 Friends is truly the dating app of the cannabis industry. The app matches people who love marijuana. Users can swipe right or left just like they would on Tinder, or they can send messages to those they like on the app. 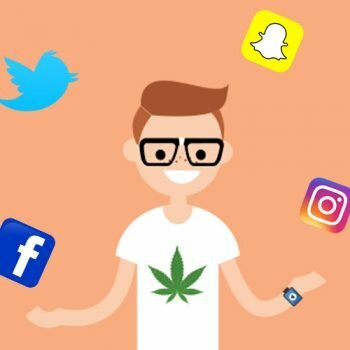 Any of the social networks above that you choose will get you front and center with consumers and people having conversations about marijuana. Time to join that conversation and show how you’re leading the way in the cannabis industry. If there is a social network you’re using that isn’t listed above, please let MMX know by leaving a comment below.